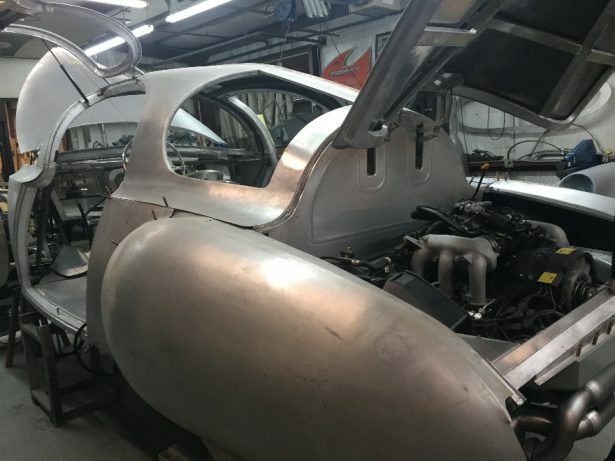 During a recent visit to Rob Ida’s shop, he told me the Torpedo project is on the downhill side of the mountain of work he had to do, and the project will pick up speed because Rob’s employees can start work on others areas of the car. As you can see in these recent photos major portions of the project are in various stages of completeness. 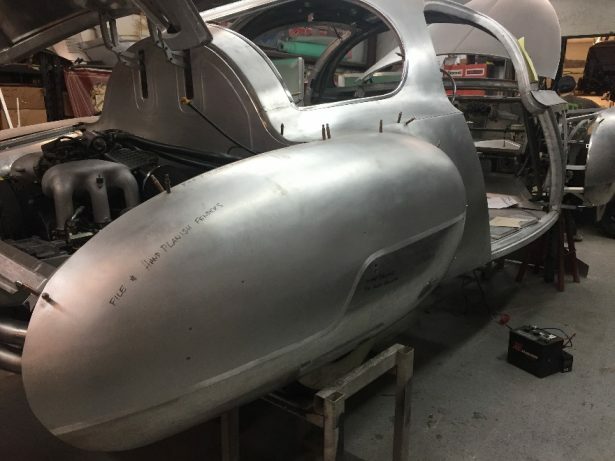 Most of the body panels have been welded together and/or glued to the underlying superstructure. Automotive adhesives these days are just as strong as welds. 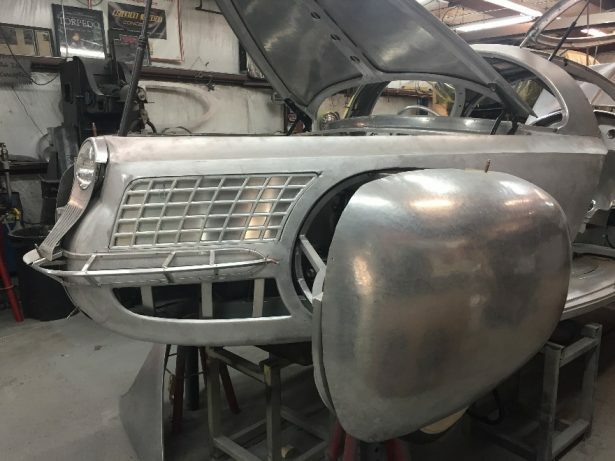 Details, such as the front grill work, the center rotating headlight and front bumpers, are in various stages of completeness. Rob’s father Bob machined the grills out of aluminum billets using his CNC milling machine. 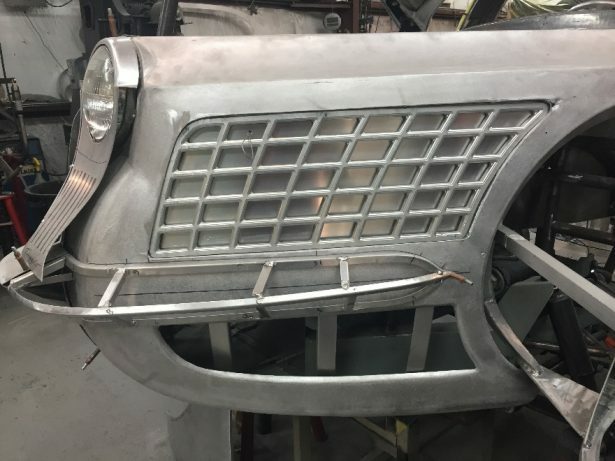 The grills needed to be shaped to the contour of the front end so Rob used his Chevy dually pickup truck and drove over the grills and shaped them perfectly to fit into the openings in the body work. Rob is always coming up with creative ways to form a piece of metal. 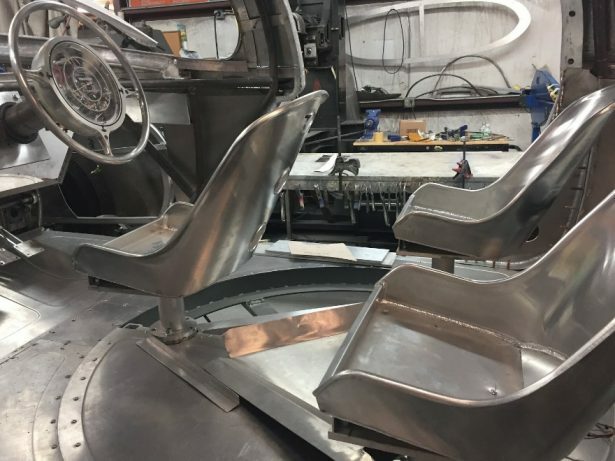 The interior of the Torpedo features the three-seat turntable, which rotates to position the driver in the center. Getting in looks easy to do without the doors in place but once the doors are mounted getting into the driver’s seat would be a bit cumbersome. The front fenders are another unique feature of the Torpedo. They rotate along with front wheels as they make a left-hand or right-hand turn. But the fenders don’t go up and down when a bump in the road is hit. 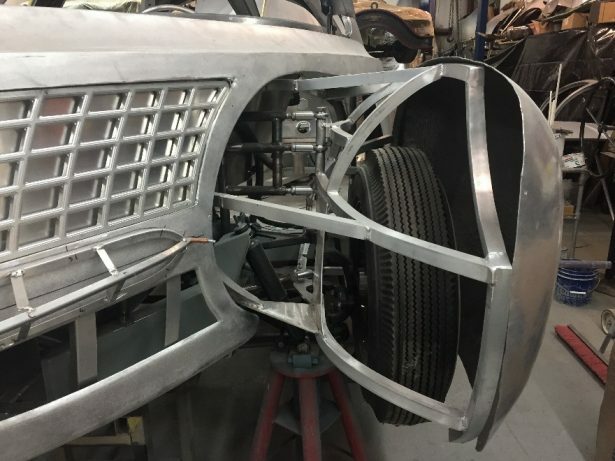 The fenders are attached to the front frame member and are driven with the steering rack at a slightly different ratio. This is done so the fenders are always turning just a bit faster than the steering. 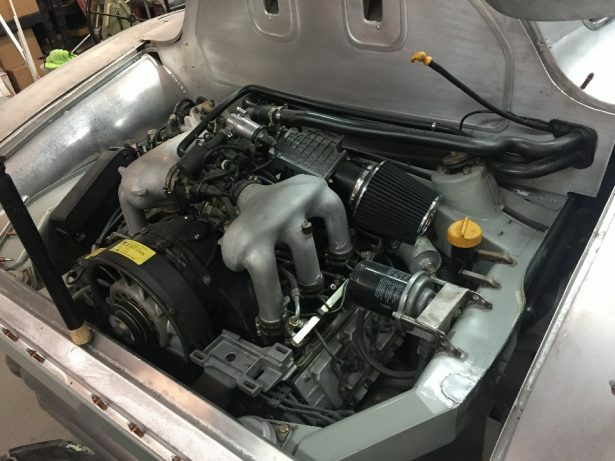 The Porsche 3.6L engine and running gear are in working order. 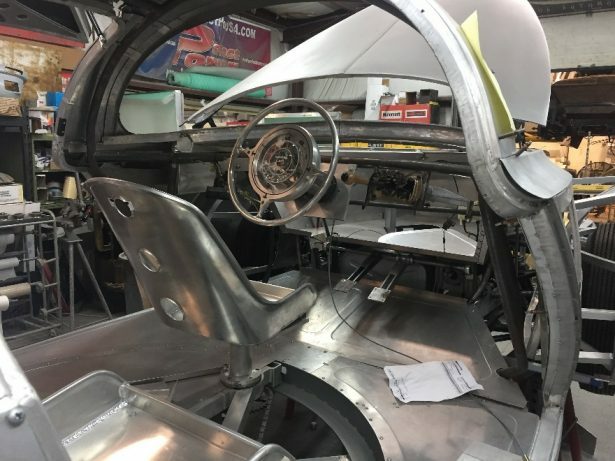 All of the necessary electronics have been packaged and mounted within the chassis of the car. Rob did an exceptional job wrapping the body around the Porsche sub frame surrounding the engine. Rob has plans to dress up the engine so it will look like it’s from the 1940’s and not the 1990’s. 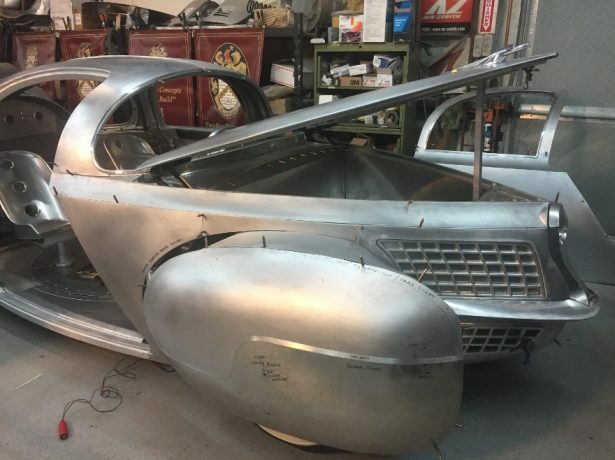 The next steps in the project are to plumb the braking system, finish the sheet metal for the front fenders, create templates for the window glass and start wiring the electrical system. All jobs that are much more straightforward then forming a body panel from a flat piece of stock.